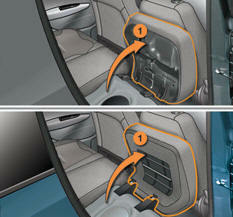 Bench seat, the left-hand (2/3) or right-hand (1/3) section of which can be folded to adapt the boot load space. These have a high position (comfort and safety) and a low position (rear visibility). They can also be removed. Never drive with the head restraints removed; they must be in place and in the high position when passengers are seated in the rear. Move the corresponding front seat forwards if necessary. Raise the seat cushion 1 lifting it with a hand from the rear. Tilt the seat cushion 1 fully against the front seat. 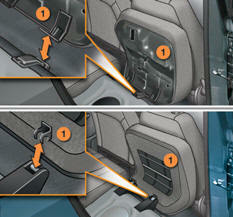 Remove the seat cushion 1 from its fixings by pulling upwards. Position the seat cushion 1 vertically in its fixings. Fold down the seat cushion 1 . Press on the seat cushion to secure it. refit the head restraints or put them back in place. The seat cushion 1 can be removed to increase the loading volume. When returning the rear seat back to its original position, take care not to trap the seat belts and ensure that their buckles are positioned correctly.